Another day of teaching in Verona. It is still hard to believe that we are here--we are so lucky! Today my class focused on Medieval foodways. It was hot in the classroom and by noon, everyone was getting sleepy and/or restless, so when the students proposed that we go somewhere, I was happy to oblige. We are, after all, here to learn as much from our environment as we can. So we all went out to get kebobs for lunch at one of the numerous kebab stands that are all over Verona. A kebab is a meat and vegetable (and other things) sandwich, packed into a thickish pita that has sliced horizontally. It is classic street food--and apparently many Veronese do not approve of these kebob stands. So we went to Piazza Bra and after inspecting one kebab place, we checked out one more and succumbed. The smell of lamb roasting was tantalizing and we couldn’t wait any longer. Kebabs are made from lamb that has been roasted on a vertical spit. The chef shaved off very thin pieces, then cut them up into smaller pieces for the sandwich. He sliced the pita in half, painted it with an orange chili sauce, then began packing in meat, lettuce, french fries, tomatoes, onions, and I don’t know what else. He finished off the kebab with a yogurt and garlic sauce (tzaziki), then I added some (optional) tabasco. The result was a large handful of tastiness. The lamb was delicious, perfectly roasted and seasoned, and the other elements and sauces only enhanced its flavor. Eating it was interesting--first, I began by picking at it with my fingers, eating bits of lamb. Once I had worked my way down a bit, I tried get a biteful--but it was just too big. Clearly street food, designed to be eaten with no pretensions to gentility--although, as I discovered, plastic forks made the job a lot easier. That’s why forks were invented. So we stood around, eating our kebabs and thinking about the combination of cultures that has characterized Italy for centuries--at least since the Romans. The Arabs brought us these spicy foods a long time ago and we still love them. This particular type of kebab, also know as a doner kebab, is originally from Turkey. It combines salty, fat, spicy hot, and cool in a convenient package. Can’t wait to try another. They say the falafel is also excellent. Speaking of packages, I went shopping last evening and bought a package of flatbreads at Verra Frutta. 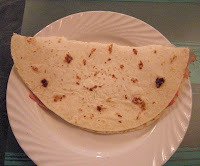 They are about 12“ in diameter, sort of like flour tortillas, and are made to be heated in a dry frying pan. 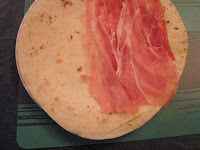 I did just that for lunch today, then laid four slices of speck/prosciutto on top, folded it in half, and ate it. Easy, delicious. These would be a great snack too--but it was perfect for a quick lunch.